Play STAGE RUSH: Imagine Dragons as your favorite Imagine Dragons band member and help families fight pediatric cancer. Created by mobile game publisher Zig Zag Zoom, this fun and fast-paced endless runner game launched today on iOS and Android. In STAGE RUSH: Imagine Dragons, you run as a member of the band to the beats of their hit songs, weaving your way through the streets of their hometown Las Vegas and the enchanting streets of Paris. For every $1.99 download purchase, $1 will be donated to Imagine Dragons' foundation, the Tyler Robinson Foundation, during the first month of release. The Tyler Robinson Foundation was created by Imagine Dragons and Tyler Robinson's family in 2015 to help families deal with the financial and emotional costs of childhood cancer. The more games downloaded, the more money will go to TRF. After the first month, 25% of the revenue from a game download will got to TRF. Here is what Imagine Dragons had to say: "The ability to incorporate meaningful charitable components in ordinary, everyday activities and purchases is something the younger generation appreciates like no other. We teamed up with Zig Zag Zoom to bring that giving spirit to mobile gaming, an area not really explored in the past. The game is a blast, but we're even more excited about the money it will raise to rescue pediatric cancer families by way of our charity, the Tyler Robinson Foundation." STAGE RUSH: Imagine Dragons is an entertaining and captivating Endless Runner game for your smartphone. Players run as Imagine Dragons avatars though Las Vegas and Paris to the beat of their hit songs "Demons," "Radioactive," "Shots" and others. STAGE RUSH: Imagine Dragons is the only mobile game where Imagine Dragons fans can play to get exclusive access to the band and give to the band's foundation, the Tyler Robinson Foundation. The game can be downloaded for $1.99 and during its first month of release, $1 per download will benefit the Tyler Robinson Foundation, a foundation formed by the Imagine Dragons and Tyler Robinson'sparents. After the first month, 25% of the revenue for each game download will go to TRF. STAGE RUSH: Imagine Dragons was developed and published by Zig Zag Zoom, a group of former Disney Interactive executives and game makers whose mission is to "Have Fun and Do Good." 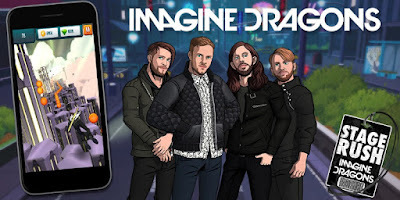 BE IMAGINE DRAGONS – Play as members of the Grammy-winning rock band Imagine Dragons - Dan Reynolds, Wayne Sermon, Daniel Platzman or Ben McKee. GET EXCLUSIVE ACCESS TO IMAGINE DRAGONS – Get access to fun and interesting facts about the band, never before seen photographs, and the chance to ask questions directly to the band. RUN THROUGH ICONIC CITYSCAPES -- Including the band's hometown of Las Vegas and the beautiful streets of Paris. RUN, JUMP, DODGE – Use your agility to dodge, slide under or jump over obstacles that block your way. FEEL THE BEAT – Run and dodge to the beat of the band's signature music. UNLOCK SECRETS AND BONUSES – Collect letters to unlock the secret bonus stage for in-game prizes! DRESS LIKE A ROCK STAR – Use in-game currency to buy new outfits and accessories worn by the band members in some of their most popular videos. FIND A FRIEND – Pick a favorite mascot or pet to run alongside. Tom Kang, CEO of Zig Zag Zoom: "With Stage Rush, we are establishing a franchise that brings together entertaining games, artists, their music and their CAUSES. Working with Imagine Dragons to launch this franchise has been rewarding and inspirational. Their passion and commitment to TRF is unwavering and totally aligned with our mission to Have Fun and Do Good." David Moon, COO of Zig Zag Zoom: "In the game's first month of release, we are stepping up our commitment to our mission by donating more than 50% of the revenues from STAGE RUSH: Imagine Dragonsto TRF. We are proud to help families fighting cancer with the Dragons." *During the first month of release, for every $1.99 download purchase $1 will be donated to Imagine Dragons' foundation, the Tyler Robinson Foundation.